Meet John Brown of Haddington (1722-1787). Brown was a man sovereignly fitted with incredible gifts, who rose from the shadows of poverty and ignorance into the public spotlight as a herald of God's Word. He was a man bleeding bibline, who lead crowds of souls to the Cross for eternal healing. Now 220 years after his death, Brown's printed and electrinic works stand as an Ebenezer-like reminder of God's graciousness to sinners. Brown entered the world in Scotland in 1722, the son of a dirt-poor Christian father who supported his family through a meager income generated by weaving. But it was a Christian home, and John's parents were loving and faithful. However, his childhood would be remembered by greater struggles. By his thirteenth birthday, John's father and mother were dead, their lives claimed by ravaging sicknesses. And as a thirteen-year-old orphan, it appeared John Brown stood next in line to die from sicknesses. But God graciously spared John's young life and restored his health. Being birthed into the cradle of poverty and orphaned as a teenager, John Brown had very little education -- with the exception of one month of language studies in Latin. Without the influence of Christian parents, John entered the world to support himself, and under his new freedoms he fell into "practical apostasy." Neglecting prayer, ignoring Scripture, and lacking concern for his soul's health, John Brown demonstrated the evidence of an unconverted heart. As an orphan teenager, John supported himself as a hired shepherd. It was during these teenage years, knowing his apostate heart and being troubled over his spiritual apathy, that Brown began traveling to hear sermons by local preachers. By God's grace two consecutive sermons (one on John 6:64 and another on Isaiah 53:4) opened his eyes to the Cross of Christ. Brown, now aware of his sinfulness, clung to the Cross for his personal forgiveness before a holy God. For the next several years Brown worked as a peddler, selling various things door-to-door, and then fought as a soldier for the Seceders defending the Edinburgh castle. But in the years following his conversion, Brown was convinced God had called him into pastoral ministry. And it was in these teenage years, by diligent personal study, Brown exhibited an amazing aptitude for disciplined learning. John Brown's family poverty made educational opportunities scarce. The most striking feature of Brown's intellect is that (although being limited to one formal month of language lessons) he would build from this little knowledge to teach himself Greek and Hebrew and later French, Italian, Dutch, German, Arabic, Persic, Syriac and Ethiopic! This was not, Brown stressed, the result of a born-genius, but of diligent self-teaching and prayerful study. As a teenager, Brown first set out to learn Greek. Brown turned to identical passages in the Greek New Testament and his Bible. By comparing Greek names to their translation in his Bible he learned the Greek alphabet because he understood the letters would correlate exactly from the Greek New Testament. Once he learned the Greek letters he moved on to the shortest biblical sentences, comparing the Greek to his Bible translation. Brown continued in this manner until he picked up sentence structure and built a vocabulary. Brown wrote in an autobiographical account later in his life: "He (God) left me a young orphan without any relations on earth that were able to help me to any purpose, he carried me through to a larger stock of learning than many others who had the greatest plenty; and all this without my being obligated to be ever in debt to, or dependent on, any person whatsoever." So how would achievements that normally work to the puffing up in pride, work in Brown's life towards humility? Word spread of this poor orphaned shepherd and his knowledge of biblical Greek. The question on the local's minds was simple: How did he learn? And those close to John quickly filled the listening ears with their own suspicion. Clearly John learned Greek through the direct tutorship of Satan himself, they said. The fumes of the gossip ignited throughout the community. While the slanderous report was idiotic (Satan equipping the ignorant in the Scriptures?) it fueled speculation, inflamed further slanders, and cut Brown to the heart. Brown struggled under the hurtfulness of the slander, but endured the pain silently. Decades later, Brown would point back to this humbling as critical in his life and ministry. Brown recalls, "the Lord most clearly delivered me and vindicated me, when I made least carnal struggling, but labored to bear his indignation as quietly as I could. The sting I had found in my learning which I had so eagerly hunted after, tended to keep me humble under what I had attained, or afterwards attained. The reproach which I myself had met with, tended to render me less credulous of what I heard charged on others." And so what others meant for evil, God used for Brown's good. The sharp blade of slander he felt was a divine gift of humility, cutting away his pride and equipping him for further spiritual duty. And what duty did the Lord have in store! By the end of his fruitful life, Brown would serve as the beloved pastor in Haddington for 36 years, and a professor of divinity for 20 years, teaching languages, theology, church history and homiletics. He is noted for authoring many books including A General History of the Christian Church, A Dictionary of the Holy Bible and the Self-Interpreting Bible, a massive 4 volume study Bible used in its day as a detailed commentary on the whole of Scripture. 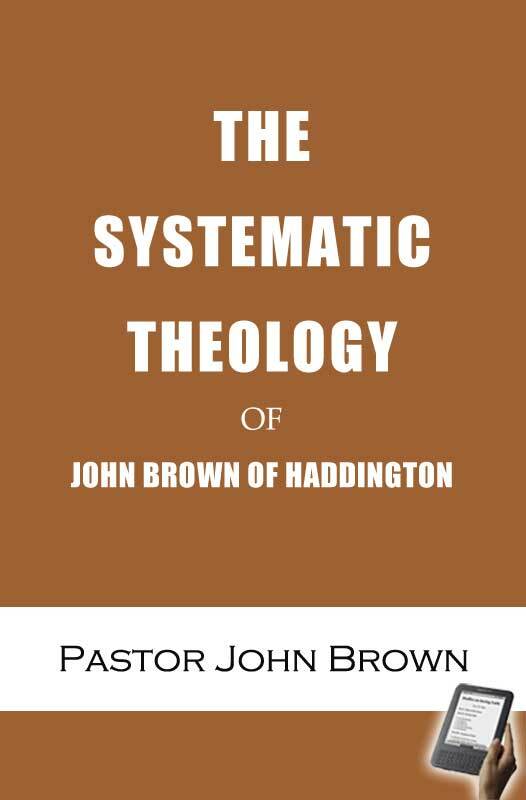 But here in this review we are concerned mostly with a work worthy of clearing space in your library collection: The Systematic Theology of John Brown of Haddington. To understand the theology of John Brown of Haddington we must see into his heart. Brown was no mere intellectual theologian, resting content if his students were intellectually challenged. While holding high intellectual standards for his students, everything in his theology applied to the heart. The rich application of Brown's theology makes it especially suited for pulpit preparation. Brown was a man sensitive to his own spiritual failings and need of God's grace. For example, Brown's wife of 18 years died when he was 49. In writing a letter to a friend shortly after this loss, Brown reveals a deep sensitivity to his remaining personal sinfulness. "In short my life is and has been a kind of almost perpetual strife between God and my soul. He strives to overcome my enmity and wickedness with his mercies, and I strive to overcome his mercy with my enmity and wickedness. Astonishingly kind on his side, but worse than diabolically wicked on mine! After all, I wish and hope that he, not I, may obtain the victory at last." This spiritual sensitivity filters through the Systematic Theology. Theology was not merely the content for a textbook but truth deeply pondered and applied as medicine to his own soul. Brown closes each chapter with serious questions for reflection connecting the theology of Scripture to the heart. For example in the section on Bibliology, the reader is not only told Scripture is precious but asked the pointed question: Is Scripture precious to your soul? He then proceeds to humbly answer the question and reveal his own heart: "Blush deep, O my soul, -- that I have so long enjoyed this scripture glass, and turned my back to it; -- so little beheld Jesus and his salvation in it! That I have had in my house this treasure, this live coal of infinite, of redeeming love, and yet my heart so little moved, melted, and inflamed by it!" (p. 98). This humble confession is part of what it means to learn Bibliology (and all of theology). "... notwithstanding all my eager hunting after most part of that lawful learning which is known among the sons of men, I was led generally to preach as if I had never read a book but the Bible. And the older I grew, I more and more aimed at this, (an observation which I had made in the days of my youth, that what touched my conscience of heart was not any airy flights or well-turned phrases, but either express scriptural expressions, or what came near to them), and led me to deal much in scriptural language, or what was near it. My imagination being somewhat rank and inclined to poetic imagery when I commenced a preacher, sometimes led me into flighty thoughts or expressions. But the Lord made me ashamed of this as a real robbing of him, in order to sacrifice to my own devilish and accursed pride." Here is why Brown's systematic theology does not fit the traditional mold. Brown's work is a catechism on steroids, comprised of almost 27,000 biblical citations (about 50 per page)! His goal is to make a statement and let you see it in Scripture for yourself. He is a trial lawyer building his case from the evidence of Scripture. He is a man mighty in the Scriptures, bleeding bibline, speaking carefully the words of another as a delegate entrusted with a priceless message. Brown's theological textbook shows him to be a man consumed with biblical phrases, terms, word pictures and imagery. So you're looking at your bookshelf and you have Reymond, Erickson, Grudem, Culver, Calvin, and maybe even Turretin. Why another systematic theology? John Brown's theology is a square peg in a round hole. It does not fit into the classic category of "systematic theology." The original title for the work was A Compendious View of Natural and Revealed Religion. Brown aimed at a different goal, namely to bring the reader under the waterfall of biblical content to be immersed in its theology and saturated by its language. Brown's goal is to help the reader see the width of biblical revelation on a given topic and then to experience the truth personally. This systematic theology is especially suited for readers seeking to be driven deeper into Scripture to experience God's marvelous truth. John Brown does not want you to be amazed at his story, intellect or far-reaching understand of theology. He wants you to look at Scripture for yourself and be amazed at its comprehensive theological tapestry woven from Genesis to Revelation. Brown's intention is nothing short of making you "mighty in the Scriptures." This, by God's grace, is what makes The Systematic Theology of John Brown of Haddington special.